In the studio there was this strange looking wooden box one side of which was covered with translucent tracing paper. 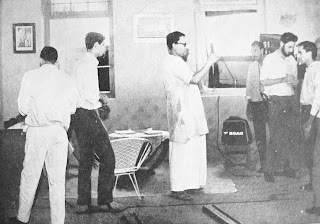 We were told that it was the invention of none other than the great master Cinematographer Subrato Mitra himself. It seems that when he was shooting PATHER PANJALI the West Bengal Government helped Satyajit Ray by providing some lights which turned out to be Police search lights ! Subrata Da adapted them for his movie work by bouncing the light on to white boards to soften the harshness of bright search lights. He also devised an inexpensive and ingenious soft light by fixing a number of house hold bulbs in a wooden box and covered one side with translucent tracing paper. Using that light he was able to create very soft and shadowless lighting effects. When he visited the Institute earlier ( around 1967 or so) he got two lights made for demonstration purposes. We used those lights christened "DUBBA" ( Hindi word for Box) lights during our practicals and found them to be very useful for soft and naturalistic lighting effects. Bala Mahendran ( Balu Mahendra) carried the idea to Madras and got the Box lights made for his films. When he started colour film work he replaced the house hold incandescent bulbs with photo-flood lamps and used them in his films for many years. He even had an assistant appointed only for carrying his personal light to the location and back. Many in Madras thought that Box lights were Balu's invention but the fact is otherwise as seen from the photograph below! Subrata Da had conducted the workshop at the Institute before I joined there and hence I did not have the opportunity to meet him or to attend his classes for a long time. Years later, I had the honour of meeting him when he came to Thiruvananthapuram to inaugurate the Indian Society of Cinematographers in 1995. He gave an excellent talk during the function and later interacted with the Cinematographers present. As President of the ISC, I shared the stage with him when he was conferred the Honourary Membership by eminent Film Director Shri.Adoor Gopalakrishnan. Though the Box light was very useful I found that carrying it to location and back is cumbersome. So when I started working in films at Madras, I got 4ft X3 ft wooden frames made on to which I stretched translucent thin plastic sheets ( shower curtain material) and placed them in front of lights to achieve similar soft light effect. In the later years it was replaced by white acrylic sheets, grid cloth etc.